The passing of R. Sargent Shriver left a big hole in his family, but it also left a big hole in the world. Everything I have read about him, all the things he worked so hard for and what he represented made the lives of so many people better. Because he believed that the athletes of Special Olympics were the very best people to represent the movement, the Global Messengers movement was begun and for this athlete and millions of others, the whole world was changed. 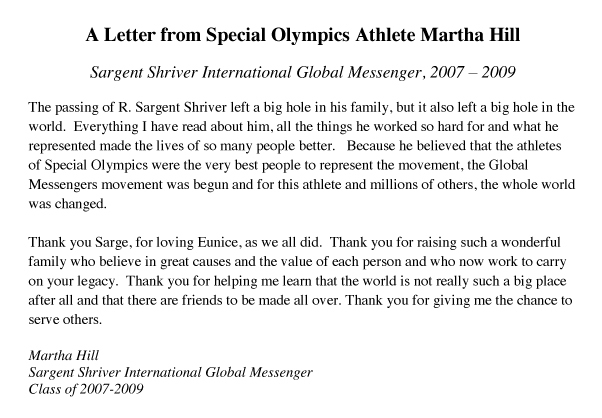 Thank you Sarge, for loving Eunice, as we all did. Thank you for raising such a wonderful family who believe in great causes and the value of each person and who now work to carry on your legacy. Thank you for helping me learn that the world is not really such a big place after all and that there are friends to be made all over. Thank you for giving me the chance to serve others.